Blom is a table lamp designed by Andreas Engesvik for Fontana Arte. 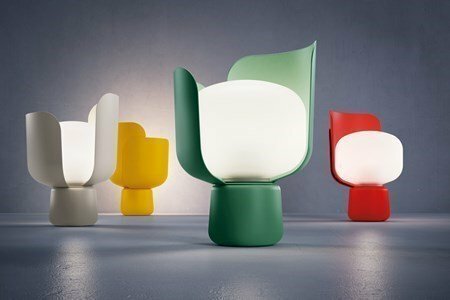 With a name derived from the Norwegian word for flower "blomst", this unique table lamp is a work inspired by the petals of a flower. To adjust the intensity of light, just move the petals that embrace the diffuser. 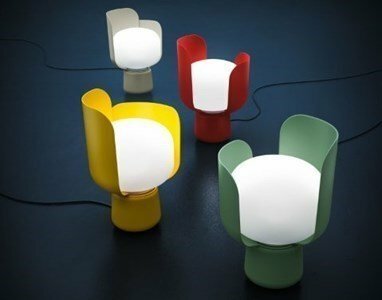 The metal base ensures the stability of the lamp and when the light is on, the petals in polycarbonate maintain a low temperature which allows touching without the risk of burns. The fluorescent lamp ensures a good and effective lighting with low power consumption. The Blom Table Lamp adapts perfectly to contemporary living trends, at home, over the table or even by bedside. The base is in painted aluminium. A fun little lamp, easy to take everywhere. In the season of earth colors, from the leaves on the floor, have you thought how to decorate your house too?